The icy moon Mimas orbiting below Saturn's rings, as captured by the Cassini spacecraft exploring Saturn's neighborhood. The moon is 246 miles (396 kilometers) wide. Paul Sutter is an astrophysicist at The Ohio State University and the chief scientist at COSI science center. Sutter is also host of "Ask a Spaceman," "RealSpace" and "COSI Science Now." Humanity has been staring at Saturn's rings for over 400 years, ever since Galileo Galilei first trained his homespun telescope on the mysterious system. The sight of the rings confused him; due to the lack of resolving power, he saw just two lumps on either side of the planet that would disappear and reappear every few years — and, to be perfectly honest, those structures still confuse scientists today. The labels scientists assign to the various parts of the ring system are the perfect embodiment of the evolution of researchers' (lack of) understanding of the rings of Saturn. And if you ever wonder how the field of astronomy ends up with nonsensical, nonintuitive, less-than-useful naming systems, I present you Exhibit A. Early on, after astronomers like Christiaan Huygens got a better look at Saturn, Galileo's "arms" turned into a "ring." Not rings — just one single disk around the planet. A few decades after that, Jean-Dominique Cassini spotted a gap running through the middle of the disk, revealing that the mystery orbiting Saturn was definitely plural. But what to call these mysterious, plural things? How about "A" for the outside ring and "B" for the inside one? Sure, makes sense. Then, in 1850, astronomers spotted a faint inner ring. So, they decided, let's go with "C."
The number of rings around Saturn stood at three until the Voyager mission, which identified a very faint innermost ring. Astronomers had a good thing going, so this ring was duly labeled "D."
Then, more-detailed observations revealed yet another ring, this one located outside the outermost, A ring. Well, shoot. What if it got the name "E," both because that is the next letter in the alphabet and because the ring made an Exception to the nice and tidy labeling system? Sure. Of course, astronomers then found a ring outside A but within E. How about F? And then another between F and E. It was all jacked up by then, so researchers stuck to G.
It's best not to think of the rings of Saturn as … well, rings. Thinking like that gets you into the madness of trying to name their structures and substructures. Instead, think of all of them together as a disk — a disk made of countless particles with sizes from bits of dust to bits of boulders, but a disk nonetheless. The "rings" are just places where there happen to be more particles than average, and the "gaps" are regions of the disk with fewer bits than average. That disk of Saturn is a dynamic, complex place, constantly evolving and reshaping itself from its own internal interactions and the gravitational influences of the planet's moons. And astronomers don't understand most of it, even after studying the system for hundreds of years. Yes, scientists get the basic gist: Gravitational feedback between the rings and the moon Mimas is largely responsible for the Cassini division (the one separating the A and B rings). The icy eruptions from the moon Enceladus continuously feed the E ring. The moons Prometheus and Pandora keep the F ring to a thin, little line, shaping it into a surprising braid-like weave. But the details are sketchy. The Cassini division is itself subdivided into tiny ringlets and thin gaps. What interactions cause those? Prometheus and Pandora obviously influence the F ring, but simulations can't get the pattern right. Spokes, kinks and clumps appear within the rings. The D ring varies in brightness every few years. Spiral density waves — the same kind of waves that give some galaxies their distinctive pattern of bright stars — propagate throughout the system. Saturn's ring system (or Saturn's disk, if you prefer) is a messy, complicated, utterly fascinating place. And at the heart of that mystery is the age of the rings. If astronomers could crack the origins of the rings, then perhaps science could begin to understand the dynamical nature of the rings' structure. Unfortunately, an answer to even that simple question has proven frustratingly elusive. Scientists don't know. The problem is that there are two parallel lines of evidence that point in completely opposite directions: one line clearly indicating a young ring system (a few hundred million years old or so, which in astronomy is considered "young"), and another conclusively signifying a system as old as Saturn itself. 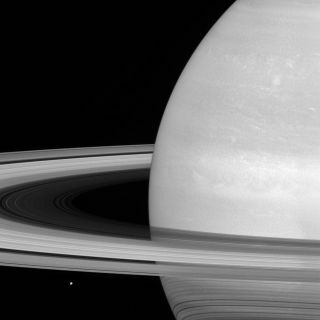 The particles that comprise Saturn's ring system are fantastically pure: around 95 percent simple water ice. But the solar system is a messy place, with dust and micrometeorites floating all around. How do the rings stay so dang clean with nothing to dust them off? With all the debris drifting around the solar system, the rings should stay shiny for only a hundred million years or so. Plus, those ring particles are constantly colliding in their frantic perpetual race around Saturn. Surely, after countless collisions, nothing like the boulders found studding the rings ought to remain. They should've been ground down to dust in short order. Ergo, these are young rings. But look at how much stuff is in the rings, almost equaling the mass of Saturn's moon Mimas! Where did all this material come from? The only time that Saturn reasonably could have, for example, torn apart an errant moon was in the earliest days of the solar system, when those events were rather common. Nowadays, the solar system is too orderly and sorted for Saturn to gather sufficient ring material to make its magnificent display. Ergo, these are old rings. What's the answer? Perhaps both conclusions are true. Perhaps the material for Saturn's rings was seeded over 4 billion years ago, but the structure is relatively young and evolving. Perhaps there's some sort of "recycling" mechanism that keeps the clumpy, icy particles icy and clumpy. Perhaps the complex dance of ring particles, moons and moonlets refreshes the system anew every 100 million years, dusting it off and giving it a new arrangement, creating an old system that appears youthful. Perhaps — it's hard to tell. Just like other disks in the universe, such as galaxies and protoplanetary systems, the physics is complicated. It's fun and fascinating, but complicated. Learn more by listening to the episode "What's Up with Saturn's Rings?" on the "Ask a Spaceman" podcast, available on iTunes and on the web at http://www.askaspaceman.com. Thanks to Jamal for the questions that led to this piece! Ask your own question on Twitter using #AskASpaceman or by following Paul@PaulMattSutter and facebook.com/PaulMattSutter.